either a way to set a Keymap to create a New Column in Database Tool Window after selecting the Table? 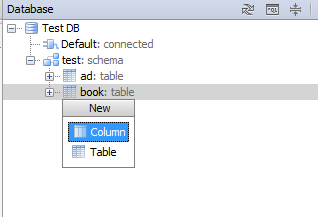 or a way to set a Keymap to open the dialog window for the selected Table in Database Tool Window? Alt+Insert (same shortcut as for "File | New") opens "New" popup menu when standing on the table/schema in Database tool window. First menu item will be pre-selected. Is this the only keymap available? There is no way to remap "Modify Column" and "Table Editor" as like as a keymap to open the full dialog window? All actions that can accept custom keyboard shortcut are listed in "Settings | Keymap" (in our case, it should be under "Plug-ins | Database Support"). If it's not there (anywhere/under any branch), then you cannot assign custom shortcut. The "New" popup menu is a "list" .. and I do not remember any other such popup that can allow any item from such list to have custom shortcut (e.g. "File | New", or Ctrl+¬ (Quick Switch Scheme) etc). In any case: you can submit Feature request asking to provide customizable shortcuts for those actions on Issue Tracker -- with good argumentation and at least some interest from other users (votes) I think it may get implemented by corresponding dev. .. there is no way to record in a Macro a "Right Click"! Which is the only action to open the dialog window. Thanks for patience, once more. No idea (I'm not that familiar with macros subsystem).